The cake came out really tall too, although that’s hard to see in the photo. After the sauce was done I put it through a small strainer to take most of the seeds out so it was very smooth. 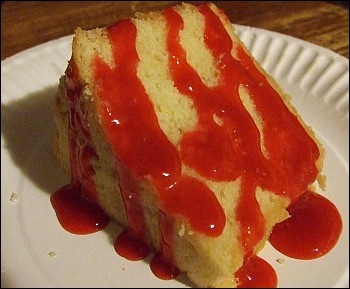 And the serving suggestion – slice a nice hunk of that cake and drizzle the raspberry sauce over it just before serving – yum! Would probably also be good with a dark chocolate drizzle or the like. 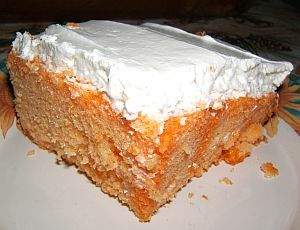 Take a small slice unless you’re REALLY hungry – as with most pound cakes, this is very dense and filling. 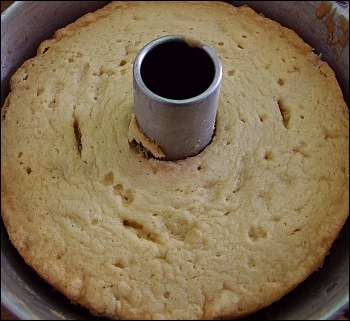 Grease and flour a tube cake or bundt cake pan. Sift together flour, salt, and nutmeg in large bowl. Set aside. Beat butter until soft and creamy. Gradually add 2 3/4 cup sugar, beating as you go, 5-7 minutes. Add eggs, one at a time, beating just until the yellow of the yoke disappears. Stir in the lemon extract. Pour batter into pan, smooth out the surface. Bake at 325 degrees for 1 hour and 15 minutes, until a toothpick comes out clean. 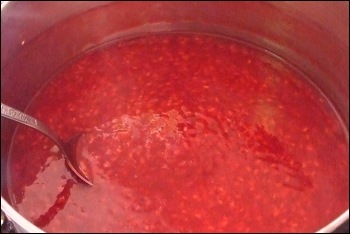 Put raspberries, sugar, and orange juice in a saucepan. Whisk corn starch in water, then add to ingredients in the sauce pan. Bring to a boil. If you want, you can also pour the sauce through a strainer to remove the seeds and make a smooth sauce. Drizzle over slices of pound cake just before serving. Comments Off on Happy Birthday, John! Happy Birthday, John and Happy Solstice too! 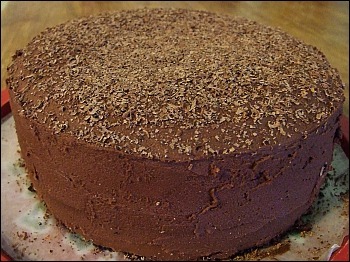 John requested a chocolate cake for his birthday this year (surprise! ), so I thought I’d check out some new recipes online. 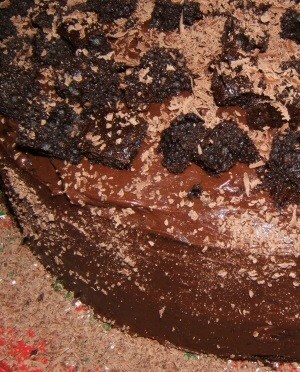 I decided to try a Black Chocolate Cake Recipe since we’re both fans of dark chocolate. The only change I made in that linked recipe was to use butter instead of shortening. The cake layers came out great – quite dense and didn’t get all puffy/risen in the middle, so no leveling was needed. For the frosting I used Caroline’s Chocolate Fudge Frosting Recipe, although as many commenters suggested on that site, I used less milk than indicated. Maybe next time I try this recipe I’ll make a double batch of frosting and do some actual decorating around the edges and such. There’s no better excuse to take photos than a Chocolate Cake Event! Mmmmm… chocolate! That is all. Comments Off on Half-Pound Cake? On my second attempt to make a cake from scratch, I went looking for a pound cake recipe. Unfortunately, I didn’t have enough eggs for most of them (a smart man would have tried something else at this point) but I found this one and thought I’d give it a try. The batter for the exact recipe was pretty bland, it didn’t taste like a pound cake or much of anything for that matter. I added a little extra brown sugar and some cinammon which gave the batter a much better flavor. The cake baked up nicely, but there is no way I would call it a pound cake. It was not nearly dense enough for one thing. 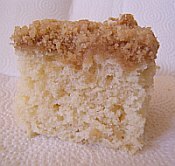 It tasted a lot more like a coffee cake, and if I make it again, I would add a crumbled mixture of flour, butter, brown sugar, and cinammon. We got some rasberries at our local Farmer’s Market last week, and thought it would be fun to bake them into a cake. I know I promised to do more cakes from scratch, but it was late so I opted out for the yellow cake mix on the shelf. I pureed the rasberries and added a little sugar and a dash of cinammon. I didn’t measure anything, I just kept adding sugar until I thought they were sweet enough. I made the cake batter and added 3/4ths of it to the pan. Then we added the rasberry goo (Kristen helped) and with the remaining batter. The cake came out great, one slight problem was that some of the pureed rasberry sank because it was heavier than the batter. If I do this again I would cut back a little bit on the water in the batter so that it will suspend the rasberry better. I had always heard that making cakes from scratch was difficult, but I found this reamarkably easy, except for being a little dish intensive. It took three bowls to make the mixture, one for the melted chocolate (I used the microwave), one for the brown sugar and liquid ingredients, and one for the flour, baking soda and salt. I didn’t have any sour cream, so I substituted milk, and since milk isn’t as dense I cut back on some of the water. I thought the batter tasted a little dusky, so I added a little confectioner’s sugar and a little cocoa powder as well. My final result was a slightly thicker batter than the recipe described, but it baked nicely and rose like crazy. We didn’t have any Baker’s chocolate to make the frosting, so Kristen made a light buttercream frosting with the remains of the cocoa powder. The resulting cake was delicious. It has a lot more body and flavor than any of the cake mix cakes, and was far more rich than any of the supermarket/bakery cakes we get around here. For various technical reasons with our kitchen at this time, I chose to go with the 9×13 sheet cake (keeping it in the glass baking dish) instead of making two round layers. 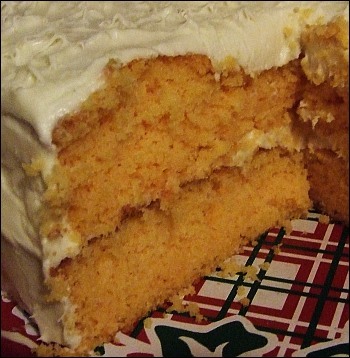 The cake mix is a basic orange-flavored cake mix. Then, you mix boiling water with a powdered orange gelatin-ish packet (in a bowl, of course), and then add cold water too. After a few minutes, which you can spend poking holes in the cake, you slowly pour the gelatin mixture over top of the cake and let it soak in, and then chill it for an hour to set. The ‘frosting’ is a white mousse mix that you just add milk to and whip up. Although buying it all in one box was certainly convenient, you could get a cake mix, a package of jell-o, and white mousse mix and create the same effect. Or do the cake and mousse from scratch too. Cake, poke holes, add liquid jello, chill, frost with mousse. Doesn’t seem like there’s too much that can go wrong with any variations. I’d definitely do some variation on this cake again. I REALLY like the white mousse and orange cake combination. The gelatin made the cake, as John suggested, a bit like a pineapple upside down cake because of the moist texture, but it was all quite light and festive and delicious in the end.